Did you know that most tattoos aren’t actually vegan? It doesn’t occur to many non-vegans, but animal products impact almost every aspect of our lives – even something as marginal and subcultured as our beloved body art! And it’s true – almost all tattoo ink contains animal ingredients. Crazy, right?! I’m lucky enough to live in Portland, where we have a loud, proud and active vegan community. So active in fact, that they’ve been organizing the Let Live NW Animal Rights Conference, which will take place here in Portland beginning June 26th. And gearing up for the event, which is an enormous undertaking and quite costly I’m sure, the community has been fundraising and benefit sale-ing like crazy. Go team! This Saturday was a big one down at the Vegan Mini Mall, with Sweet Pea, Food Fight!, and Herbivore all promising to donate a portion of their sales to the conference. And over at Scapegoat Tattoo, they were offering an incredible special: $30 Tattoos for the Let Live Foundation! How could I resist? A vegan tattoo with a vegan theme by a vegan artist, all to benefit a vegan awareness event? Yes please! So this is my new tattoo, small and sweet and totally, totally perfect. I think it suits me well, don’t you? Massively special thanks to Brian at Scapegoat Tattoo for the awesome job and impromptu sit-in. If any readers are ever in P-town, you’ve gotta look these guys up. They’re the best! I DID know that! There is a brand of ink that is 100% vegan, I want to say that it’s called Eternal, but I could have it confused with something another brand. I also think that I met Brian a few years ago at a convention, and remember he was darling. Maybe it wasn’t Brian, but I do remember he was a vegan tattoo artist from Portland at that shop. I am full of vague notions, it would seem. I like it! Even better with the good cause! And yes I knew that about tattoo inks. It is a bit upsetting that my tattoo was most likely done in “bone black”, even if I did get it years before going vegan. I have already found a vegan artist who uses all vegan ink in Austin that shall get my business once I have the money to spend. Adorable, but in an intelligent and even a bit edgy way! @ Tammi – My first tattoo is not vegan either, meh. It is what it is, and now we know better, right? I love Austin, I bet there’s plenty of vegan options there! @ Kelly – Thanks! Are you here in p-town? @ Kelly – Ahhh, neighbor! Wow!!! I hadn’t thought about tattoos being non-vegan! Yikes! I have so many and alas, fretting about it now will get me nowhere, however I WILL ask my artist if he will get some vegan inkies for me and my hubby. Thanks, ya’ll! @ April- Yes yes, no use fretting over the past! It’s just an awesome opportunity to change direction in the future. Vegan tattoos ahoy! I actually have many tattoos being that I used to be a tattooist before I started expressing myself through hair styling. But I wish I had known about vegan ink mainly because some of my tattoos now stand up at random times. I have looked for solutions as too why my tatoo will lay flat at times only to stand up visibly so that you can feel it when you run your fingers over it even see it. The first thing I thought was my high blood pressure was causing it and later found that was not the case infact it was a chemical in the black ink causing the problem. It’s even possibly there are metal particals in my black ink! So there goes ever geting an MRI or catscans. It’s a scary thought and I really wish being a tattooist that someone had informed me of a safe alternative. @ Katta – That’s weird about the raised ink, though I have heard about it from others. One of my tattoos is vegan, the other is not (got it before going vegan). I feel so much better/safer with the vegan one! It is very weird that is true. And I think the next time I get tattooed I’m going to try the vegan ink if I can. Do you know if it’s more likely to fade out or anything like that? @ Katta – My understanding is that the quality stands up to conventional ink. 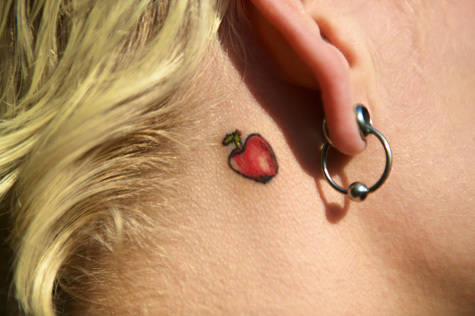 I’ve seen a lot of vegan tattoos and they all look great to me! HA! Nice to see someone else with one behind the ear…I have 3 small stars behind my left ear. @ Lenn – It’s one of my favorite spots. So cute! can you follow up with a place to buy these clean nontoxic inks? My boyfriend and I went to Portland for vacation in 2009 to experience Vegan Heaven. There’s only one vegan restaurant within an hour of where we live in PA. We both got tattoos by Henry at Scapegoat while we were there. The tattoos are beautiful, and I want to go back for more tattoos! I was curious, how can tattoo’s be vegan? Like what type of ink is used that makes them non-animal product i guess is what im asking. I’m not vegan, but i do care about whats going in/on my body and whats harmful to animls. brilliant occupation broo. Because skin image is actually a long-lasting photo this cornered always in the body.